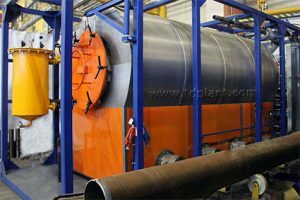 Pyrolysis plant TDP-1-1000 was procured on the territory of the Uvat group of fields under the contract between IPEC (Production Company) and Rosneft (Customer). It is the first shipment of the pyrolysis facility of IPEC manufacture in 2017. TDP-1-1000 is capable of processing oil sludge, waste oil, oil-contaminated soils, rubber, and geotextile. The capacity of the plant is 1000 kg/h per 1 cycle. TDP pyrolysis plant corresponds to both the Customer’s needs and requirements of international environmental legislation. According to the official records, the total geological reserves of the Uvat group of fields is 1.2 bln. tons of oil. TDP-1-1000 will provide environmentally-friendly and cost-effective waste processing in a long-term prospect.